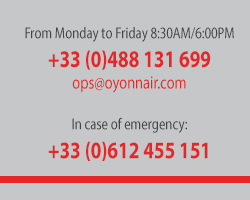 Oyonnair has its own aircrafts based in Lyon Bron, Paris Le Bourget, Rennes and Marseille airports. Versatile aircrafts for up to 8 passengers, configurable for single or double stretchers medical evacuations, VIP transport or cargo. For your safety, our fleet has the latest technology on board, all our aircrafts are less than 10 years old. Our Piaggios Avanti are convertible: single or double stretchers for medicalised flights.